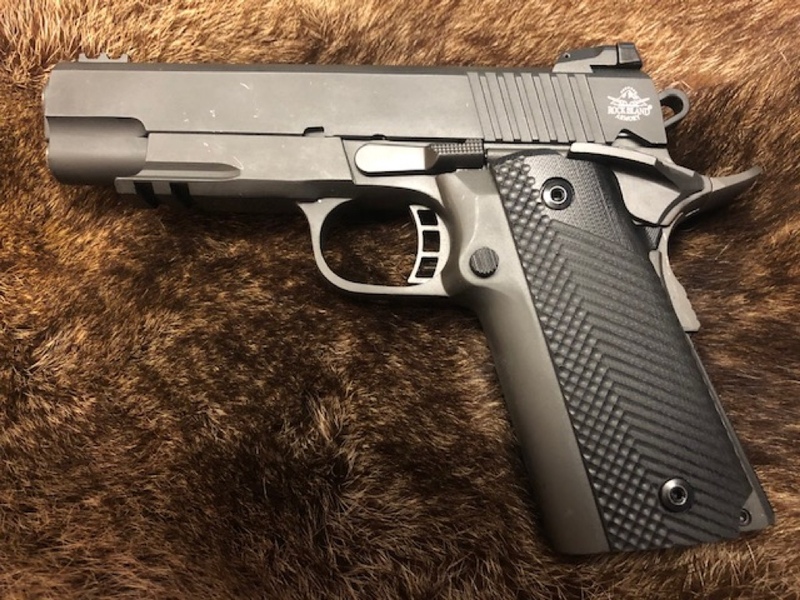 The Rock Island Armory (RIA) TCM Tac Ultra MS is a multi-caliber high capacity 1911 style pistol with a frame rail for mounting accessories (lights, laser, etc.) 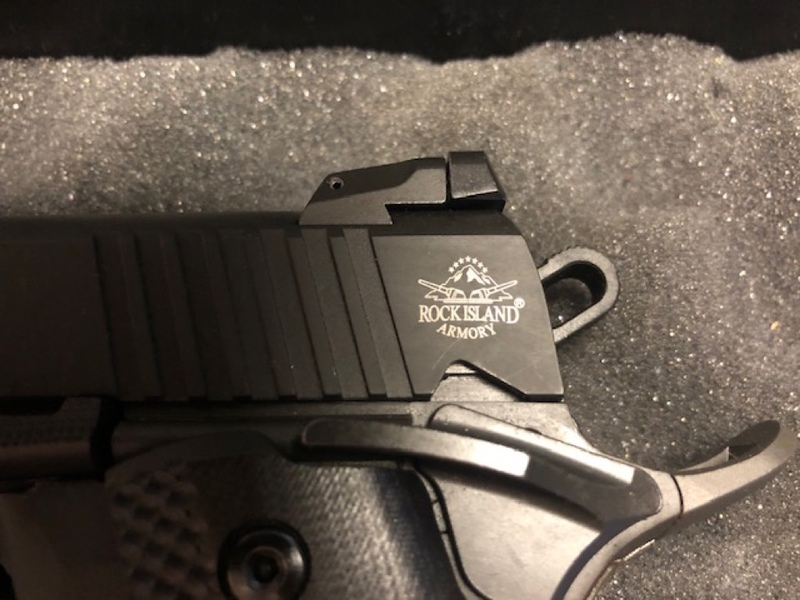 and a 4 1/4” frame (Commander-size) slide and barrel, which Rock Island refers to as their “MS”(for Mid-Size) configuration. 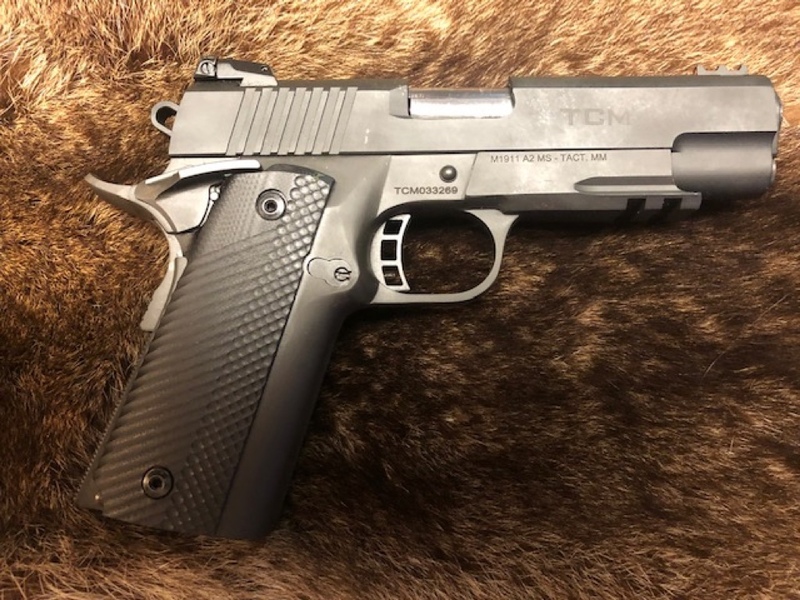 The multi-caliber combination for this pistol is because the same pistol can be used to fire either conventional 9mm Parabellum ammunition or Armscor’s proprietary .22 TCM (for Tuason Craig Magnum) cartridge. The test pistol included two double stack magazines capable of holding 17 rounds of 9mm, or 18 rounds of .22TCM, as the 22TCM case diameter is smaller. Also included were two fired .22TCM cartridge cases, a .22TCM barrel, and a recoil spring for that barrel. A 9mm barrel and recoil spring came installed in the pistol. When the pistol arrived, it showed obvious signs of having been fired on previous occasions. It was far from NIB, and the pistol case contained no manual or other documentation. RIA staff advise that new Tac Ultra MS pistols generally ship with the .22 TCM barrel and recoil spring installed. A manual and lock are also included. RIA logo is small, and located on the left side rear of the slide, behind the cocking serrations. The slide is flat-topped, with both front and rear sights set into machined dovetails. The rear sight is adjustable for windage and elevation. 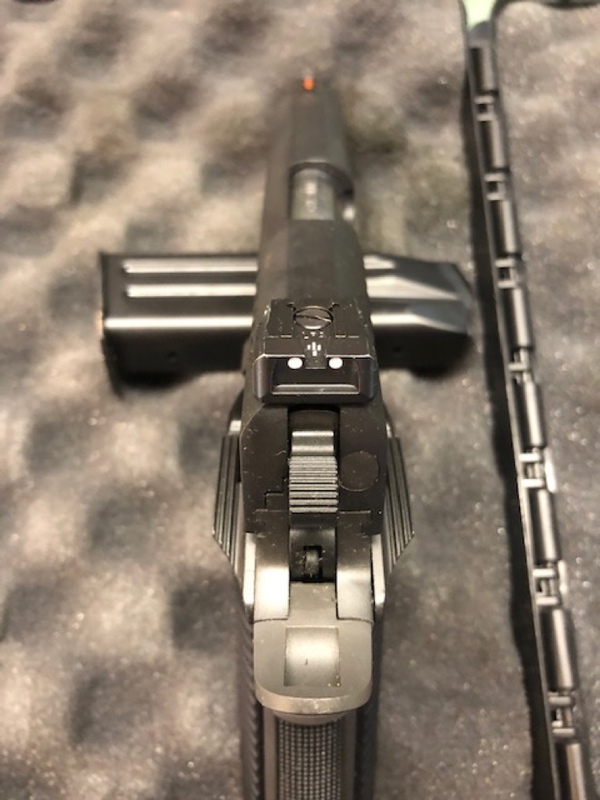 The rear sight has two white dots located on either side of the notch. 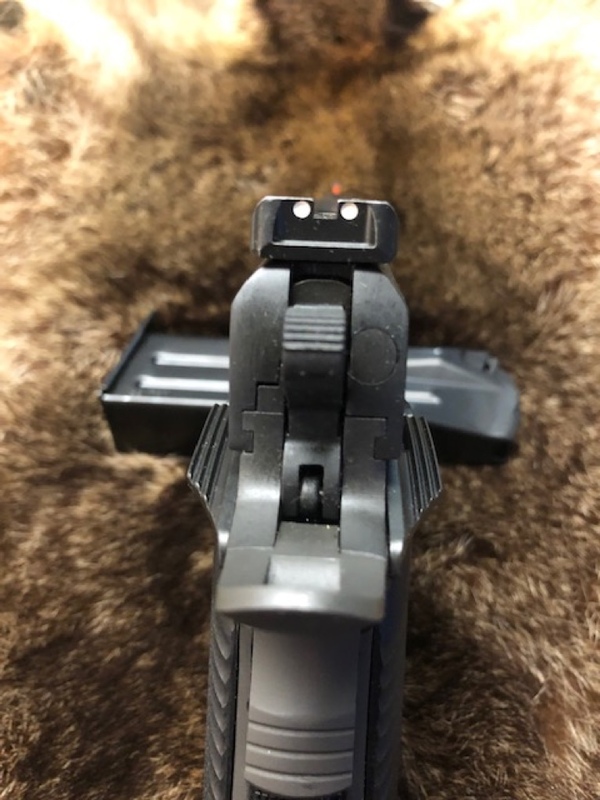 The front sight has a red dot. Overall, the sights present a clear sight picture that’s quick to find. With the exception of the roll marked “TCM,” the right side of the slide is unmarked. Of note in the above picture, the ball cuts on the slide match up perfectly with the front of the frame’s dust cover/accessory rail. The slide to frame fit is quite good. Even after cleaning, with no lube on the slide and frame rails, side to side movement between the slide and frame was minimal. The takedown and slide stop notches are properly shaped, and the slide stop and grip safety are all nicely fitted to the frame. All told, the fitting and machine work of the pistol was first rate. breaking cleanly at an average of 4 pounds, 2.3 ounces over six pulls using a Lyman digital trigger pull gauge. 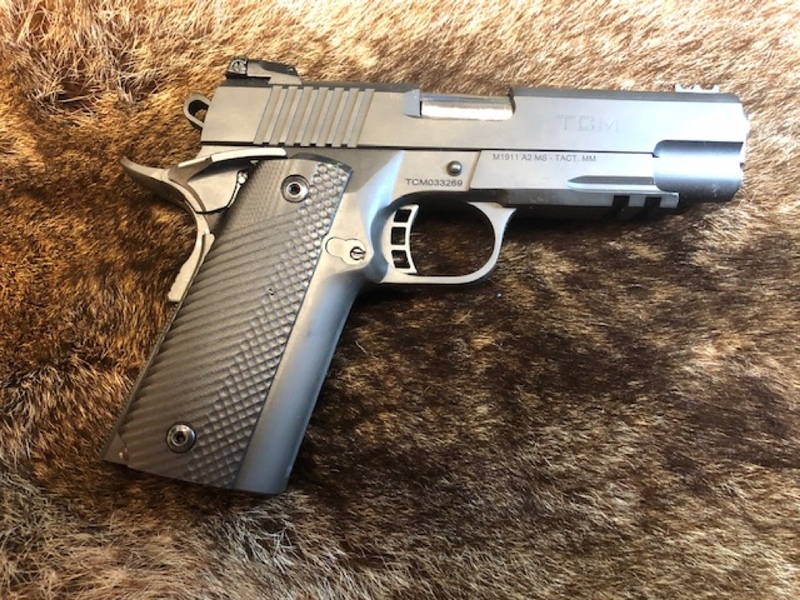 The TCM Tac Ultra takes down like any 1911. In the above photo, readers will note the .22TCM barrel and recoil spring. These two parts are all that’s necessary to change the caliber to 22TCM from 9mm. Armscor provided me with 250 rounds of their 124 grain FMJ 9mm ammo, and 100 rounds of 40 grain JHP 22TCM ammo, to use in the testing and evaluation of the TCM Tac Ultra MS. Since my evaluation took place over a few months, I utilized several additional boxes of ammunition from my own supplies. That 9mm ammo, consisting of some Winchester white box, and my own reloads, was not used during the accuracy testing phase of the evaluation. I was provided much assistance with this part of the review by Mr. Andy Maluke. 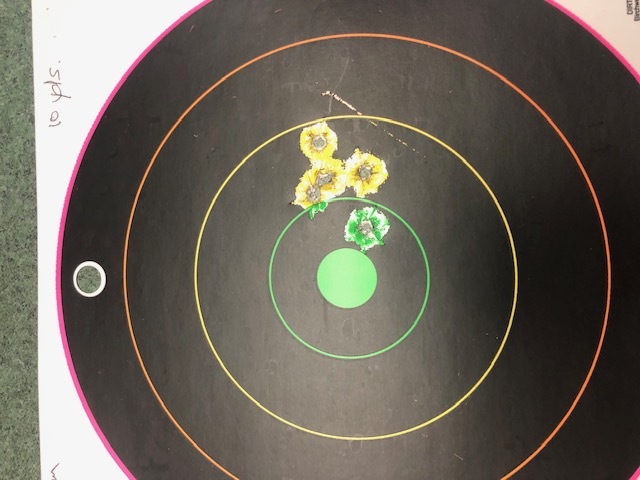 Andy provided access to the 200 meter range at the Hernando Sportsman’s Club, as well as his chronograph, sandbags, and miscellaneous equipment used in shooting the TCM Tac Ultra at 10 and 25 yards. Andy is a board member at the club, is an IDPA expert class shooter, and Safety Officer Instructor. He was also the IDPA Match Director at the club for many years. Since my old eyes aren’t what they used to be, Andy shot the groups reported here at 10 and 25 yards. I shot the offhand rapid fire targets at 10 yards. 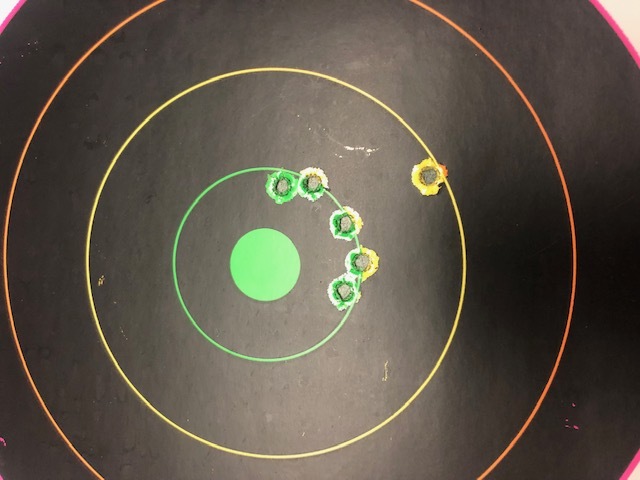 I shot 50 rounds of the 22TCM ammunition at 10 yards offhand, then changed out the barrel and recoil spring to the 9mm caliber, and shot another 100 rounds in that caliber, at various reactive targets. I wanted to both get a feel for the pistol, and give it a chance to settle in. I’m pleased to report that the pistol functioned flawlessly, with no malfunctions either during the testing that day, or over the following months when I carried it daily, and shot it weekly. As noted above, the pistol wasn’t new, and had obviously shot by others before I received it, so I have no idea what, if any, break in was required. Next, Andy shot five rounds of the Armscor 124 grain FMJ 9mm ammo through his chronograph, for an average velocity of 1112 feet per second, with an extreme spread of 19.82, and a standard deviation of 7.07. That was a real eye opener for me, as that’s match ammo quality at range ammo prices! He then changed out the barrel and recoil spring to the 22TCM caliber, again firing five rounds through the chronograph. The 40 grain jacketed hollow point bullets averaged a velocity of 1848 feet per second, with an extreme spread of 120, and a standard deviation of 47. 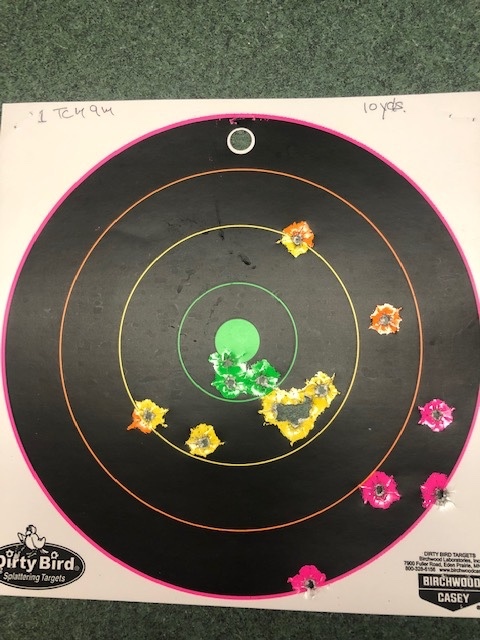 Throughout the testing, I didn’t make any adjustments to the sights, and, at 10 yards, both loads shot pretty much to the same place. 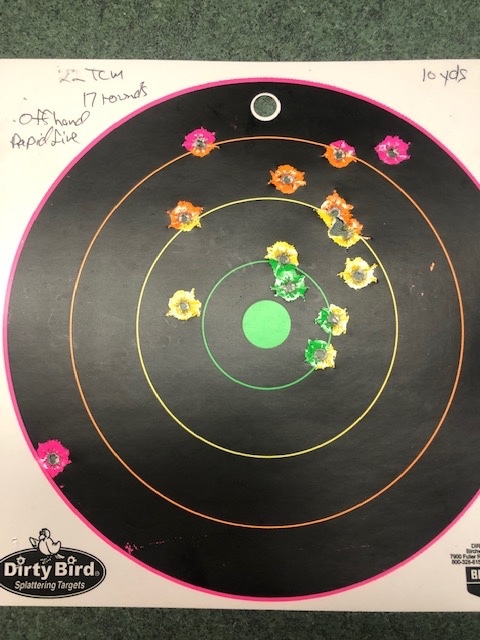 This five round 9mm group shot by Andy at 10 yards measured 1.17 inches. 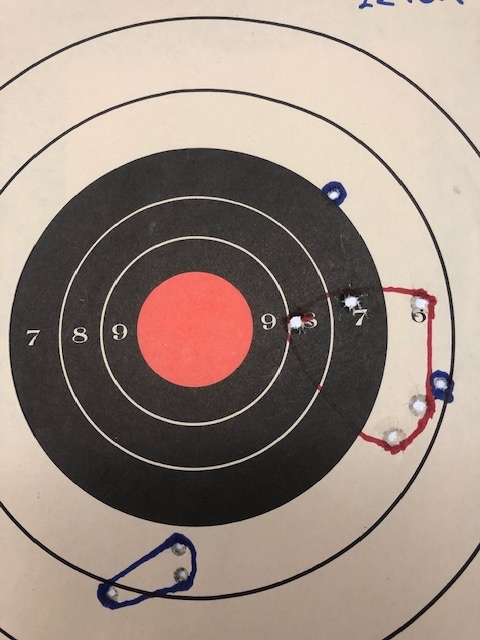 This five round 22TCM (with a discounted “called” flyer making the sixth low shot on the target) group Andy shot at 10 yards measured 1.24 inches, with the flyer opening the group up to 1.43 inches. Of particular note is the similarity in the point of impact for both calibers at ten yards. 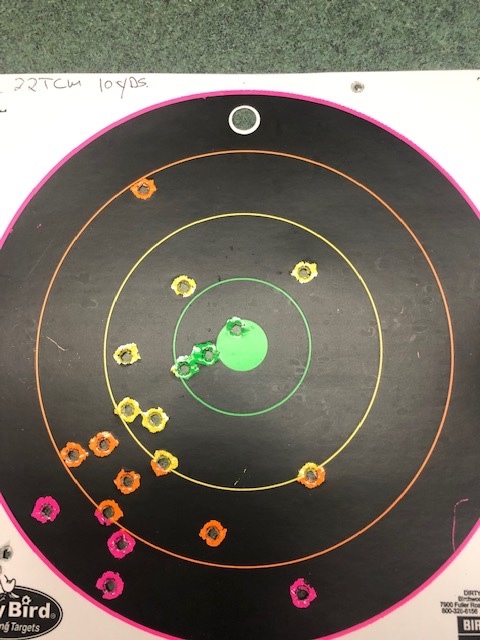 This target, shot at 25 yards, contains the groups shot with both calibers. The 22TCM group is a good bit larger at 6.50 inches (with a three shot group of 1.07 inches), compared to the 9mm group size of 2.05 inches. It’s apparent that the points of impact for the two loads are diverging more at the longer range, with the faster 22TCM load striking the target noticeably lower than the slower 9mm load. All groups, with the exception of the 6.50 inch group, were measured from center to center of the farthest bullet holes, using a digital caliper. This target was shot at 10 yards off hand, rapid fire, from the sitting position, firing the 22TCM ammunition. This target was shot at 10 yards off hand, rapid fire, from the sitting position, firing the Armscor 9mm ammunition. This target was shot at 10 yards off hand, rapid fire, standing, firing the 22TCM ammunition. The weather conditions at the range that day in late August had temperatures in the high 90’s F, with a relative humidity to match. Our clothes were soaked through in short order that day! 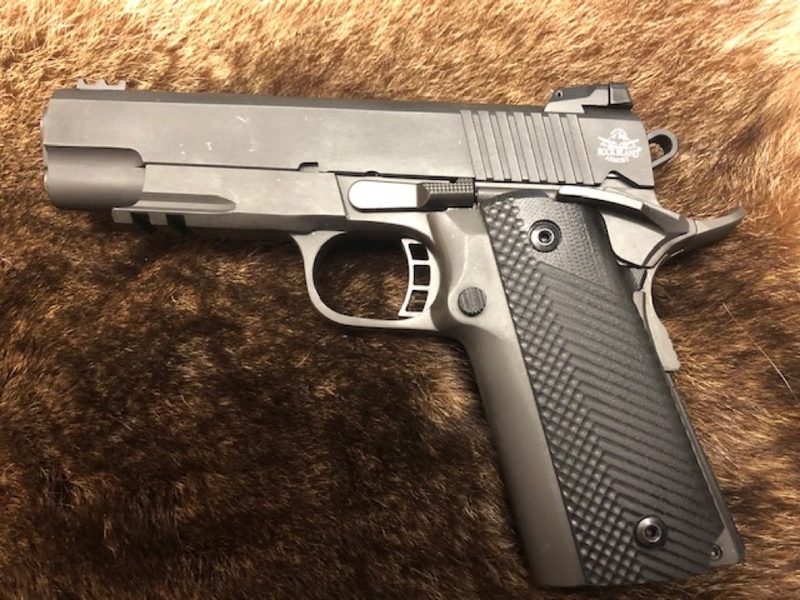 Since in my estimation any 4 1/4” 1911 with an accessory rail is probably intended more for carry and self defense use than as a range pistol, I decided to carry this one for a bit, as in daily carry, for almost three months. My personal taste in 1911s runs more to the classic, so I didn’t have any holsters in my 1911 holster “collection” specifically designed for a railed 1911. I had to dig deep into the holster drawers, but I did manage to find one that worked pretty well; an IWB Wilson Combat Featherweight holster. That necessity addressed, I carried that all steel 1911 daily, and shot two or three magazines of 9mm every weekend, averaging about a box of ammo per week. 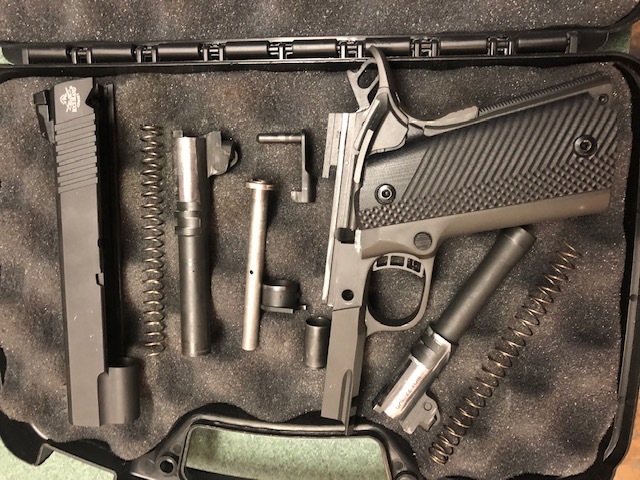 So much for the “1911’s are too big and heavy for carry” crowd. Further, since I wanted to give the pistol a thorough wringing out, I didn’t field strip or give it a thorough cleaning. 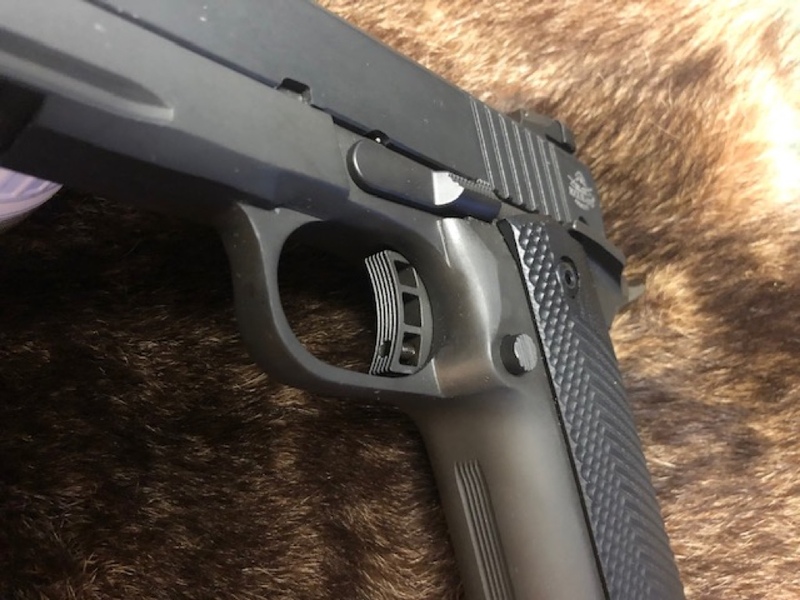 After shooting, to protect the finish from our coastal Florida heat and humidity, I’d wipe down the outside of the pistol with CLP, lock the slide to the rear, run a little CLP down the frame and slide rails, and wipe off the excess. This particular TCM Tac Ultra MS can definitely take a licking, and keep on ticking! It hasn’t been cleaned since that first range trip back in August. Of course, I will give the pistol a thorough cleaning before I return it. That said, this was an evaluation. I’d never recommend that anyone go without cleaning their carry pistol after firing! I personally like to know that my carry pistols are capable of flawless operation, even when filthy from a high round count between cleanings, so I’ve subjected all of my serious carry pistols to even worse conditions; a high round count with no wipe downs or rail lubing, usually over a 1500 round count training weekend. My main IDPA gun gets cleaned every three months or so, with a similar round count. I’m providing this bit of extraneous information so y’all don’t think I’m totally crazy! I just like to know that, if everything goes completely off the rails, my carry pistols can be counted on to protect me and my family. After living with the TCM Tac Ultra MS for several months, I can say that it’s a pistol I’d count on to protect me and my family without any reservations. The accuracy this pistol displayed was very good, and the reliability was even better! 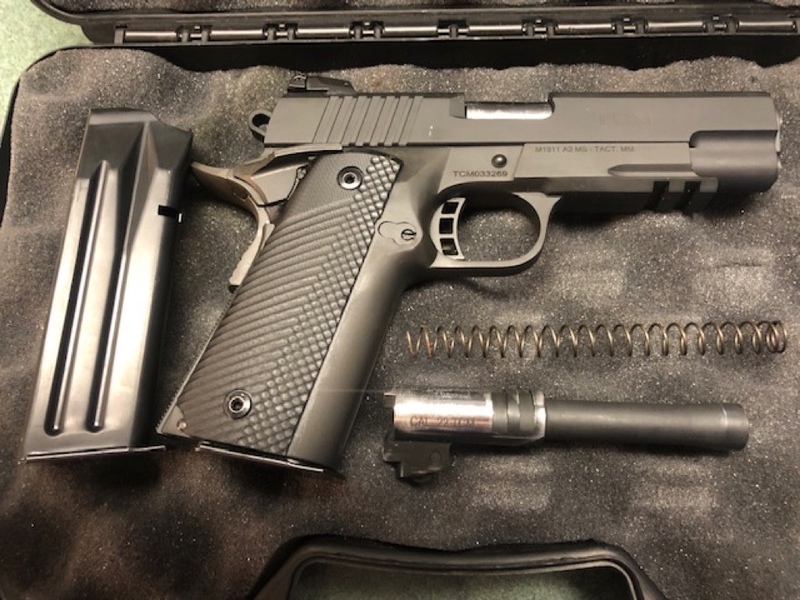 I believe that anyone in the market for a high capacity Commander sized multi-caliber 1911 should give the RIA TCM Tac Ultra MS very serious consideration. This is a pistol that performs well above its price point! First, the staff at Rock Island Armory and Armscor USA should be recognized for both providing the pistol and ammunition used for the testing and evaluation in this article. I also must extend sincere appreciation to the Hernando Sportsman’s Club and Mr. Andy Maluke for use of the range facilities, equipment provided, and Andy’s expertise in conducting the accuracy testing.